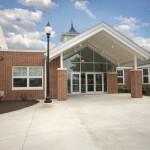 The Community Open House and Rededication for Central Manor Elementary School was held on Sunday, October 16, 2011 from 2 pm to 4 pm. 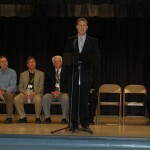 A short rededication ceremony with district personnel and Representative Ryan Aument addressing the attendees was held in the all-purpose room at 2:30 pm. 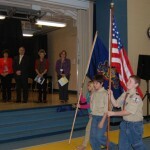 Representatives of Cub Scout Pack 88 and Girl Scout Troop 71947 led the group in the Pledge of Allegiance and Central Manor music teacher Sarah Repkoe led the singing of the National Anthem. 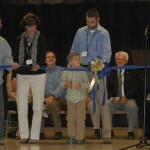 Pictured is the ribbon cutting ceremony featuring four generations of Central Manor students – from left Ed Funk, Dianne Funk Smith, Daryn Vinson and Carter Vinson. Central Manor students conducted tours for those interested in seeing the recently renovated building. 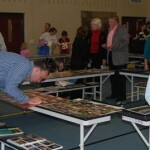 A history of Central Manor display was set-up in the all-purpose room featuring class pictures, report cards, photos and news articles for Central Manor Elementary spanning 50 years. 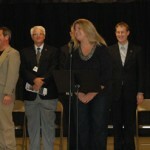 Several hundred people attended the event.